By asserting its rights over some rocks in the Pacific and the airspace high above them, China has suddenly thrown into question the structures of power and sovereignty in the Pacific, top to bottom. We have begun to witness the future arriving, as always clumsily and a little fearfully, and the reassuring past receding—meeting the resistance and reaction that are also reliable features of all historical transitions. The immediate questions Beijing has pushed to the front of the table are complex, technocratic, and material: They are at bottom functional problems. But we have a forest-and-trees matter before us now, and it is immense and simple all at once. China’s new, assertive, and decidedly militarist president, Xi Jinping, has just announced that the People’s Republic will now take its place as a world power. Instantly it is evident that no one—not the mainland’s neighbors and not the United States—is ready to respond coherently (to say nothing of intelligently). China’s emergence has been an active idea these past several years, but primarily in the abstract. Now the reality of it is rolling at the Obama administration like a big, black bowling ball. Vice President Joe Biden is in Asia this week, the China question more or less his full agenda. This is as it should be—somebody ought to be there. But sending a former Delaware senator with no experience of Asia and no evident knowledge of its workings? The State Department has long been short of Asia hands, notably since a generation of good ones were hounded into exile or suicide or second-rate universities during the early Cold War years. (Remember the “Who ‘lost’ China?” debate after Mao took Beijing?) Biden simply reminds us: Washington does not have the technology to address what is now upon us. Having dwelt in Asia for three decades, I’ve come to think it odd that power (im)balances, security structures, and the region’s diplomatic données went 40 and then 50 and then 60 years without a rethink. Even during the Cold War’s later years this remained an unmentionable. After Germans took down the Berlin Wall, correspondents who addressed the problem of sclerosis in East Asia did so gingerly. Immediately at issue and in all the headlines these days are two questions new only to those not paying attention. 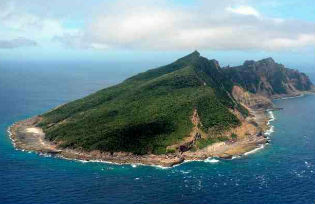 One concerns a few barren rocks in the East China Sea, administered by Japan but claimed by Tokyo and Beijing. Sovereignty is at issue, yes, but the substance of the islands dispute lies in the resource deposits beneath the Senkakus (Diaoyus to the Chinese). The other question stunned everybody (and ought not have) when Xi’s government pushed it into play 10 days ago. China now asserts jurisdiction over airspace off its shores that has long been the preserve of Japan and (to a lesser extent) South Korea and Taiwan. Washington was right to stay clear of the Senkakus argument, even as it is obliged by treaty to stand for Japan’s security. Despite the occasionally nerve-wracking suggestions of military alternatives, this is two households fighting over the backyard fence. But the airspace claim ups the ante to the point the United States cannot stay out of it any longer. It is all about the bigger question of power in the Pacific now. And there is only one way this can turn out well. A new settlement is required that recognizes the imperative of power-sharing in order to achieve a re-imagined stability. We should look at the islands question with this in mind. Japan first took the Senkakus in 1895, when it was extending Emperor Meiji’s empire; dynastic China was collapsing, and anyone interested in the carve-up could intrude without serious resistance. The Senkakus fell to the United States in 1945, and Japan resumed sovereignty when Tokyo and Washington settled up on the postwar “reversion” deal in 1972. This was Cold War boilerplate by that time. There is no self-evident sovereignty over the islands, then. China purports, with supporting texts, to have discovered them by 1400. But the most substantive claim would make them Taiwan’s. So it is politics and circumstance that now have to be addressed. Contention between Beijing and Tokyo has increased since mineral deposits were found in the late 1960s. But only now does the problem tip over into assertions of great-power status. We come now to the airspace question. It is not so complicated as it seems if you consult a map, and the New York Times has drawn a good one. Japan’s claims to jurisdiction are grandiose, far to the south and west of Okinawa’s shoreline, ham-handedly close to China’s bulge into the East China Sea. The claims of Taiwan (as the Republic of China) and South Korea are less ostentatious, but they, too, suggest a certain pretension. These three—one nation, one just-created nation, and one rarely recognized nation—were Washington’s principal Cold War allies in East Asia; the United States drew these lines for them in the early 1950s. In essence, the map shows us what containment policy in the Pacific looked like from, say, 35,000 feet. Much has been made of China’s pugilistic manner as it asserts its new jurisdiction. It requires pre-notification of all flight plans routed through the zone; it reserves the right to respond to transgressors with force, having already scrambled fighter jets as if they were patrolling police cars. Xi is a prideful nationalist given to articulating status by way of military display. But “aggression” is the wrong term, popular as it is among American commentators. All nations defend their airspace claims, sometimes with force. Several European nations invoked air rights earlier this year to prevent Edward Snowden’s flight from Moscow to one or another Latin American capital. “Aggression” might apply when, obviously at Washington’s insistence, the plane of Bolivian President Evo Morales was forced down in Austria with the idea Snowden was onboard. Xi’s Beijing at least has the virtue of consistency. Washington and its allies have been slapdash by contrast. Japan’s commercial carriers observed the Chinese rules—good judgment—until the Abe government told them not to—reckless judgment—and then told them, yes, observe the rules—sound if messy. The Obama administration also issued a “guidance” (a week after the fact) advising American carriers to play by the rules. It was advertised as precautionary, and fair enough, but Obama’s hawkish critics will be right when they say it is a prelude to accepting China’s claim—which is precisely what makes Obama sensible this time. South Korea, Japan, and the United States have all sent military aircraft into the zone without notification—a childishly pointless pout. Defense Secretary Chuck Hagel proved the most obtuse official on any side: Sending B–52s into the disputed zone rang every wrong bell in the temple for any Asian with a memory of the Vietnam War. Those planes are totemic omens of Western aggression at the other end of the Pacific. He ought to have understood this. Washington wise men of both main stripes now talk of maintaining American “credibility,” asserting the necessity of “standing up” to China. This is no longer where American credibility lies, however often (or not) it may have once. Everybody knows about the ridiculous defense budget and the Strangelovian obsessions with technological killing devices. America has suffered a credibility deficit for some time, but primarily because it has proven incapable of facing history and radically unpracticed at agile diplomacy that responds to the world as it is. This is not promising. The reference point is yesterday, not now or tomorrow. The U.S. position going into this crisis is to refuse history, paradoxically, by insisting on history. It is true the Japanese and Koreans are nervous about their dependence on U.S. leadership. But nursing their insecurities is not leadership: It is to follow. Leadership would require that Washington show a new way forward (starting with acknowledging the need for it). “Resident Pacific power” is an especially worrisome bit of plain chicanery. It is carefully encrypted code, of course. The United States has much frontage on the Pacific lake, but it is resident in Biden’s meaning only by virtue of a forward position established during the Cold War. The nub here is simple: America is a Pacific power, check; it is not an Asian power—uncheck the box. China now obliges the United States to recognize the distinction and stop pretending otherwise. For one thing, Xi comes to power as the Communist Party’s control is under mounting threats—economic (income disparity and attendant discontent), sociological (rising aspirations of numerous varieties), and political (over-the-top corruption, the more-than-faint mumbles of democratic dissenters). Mandarins in Beijing have used challenges from abroad to identify power with nation since the Opium Wars—and times 10 since the Japanese invasions. Xi needs to assert if he is to ride the restless tiger for his decade on its back; he already has the Chinese roused over the islands and the airspace question. It is a question whether Washington understands this as a compelling drive. • China was a civilization before it was a nation. Its neighbors were tributaries. So we have another paradox: China sees the future in its past. The Southeast Asians have been mostly supine in the face of China’s rise. It mostly means money in the bank, and they resume tributary status with more or less grace (having little alternative). Not so the Northeast Asians. It is plain that a very old sphere of influence is re-emerging, but this brings the second reality to the fore. • That is, the nation-state is an imported technology to all Asians, arriving from the West in the course of the late 19th century (and in some cases the 20th). As a machine it operates cumbersomely. National identities are obviously strong, but these are put on somewhat as one puts on clothes—which can make them, if anything, stronger still. Old forms of relations have to be re-interpreted, then. They will be, but this is by definition an entirely Asian affair. Once again, there is no role for the Westerner in the process, which will be long. A note of optimism is always good at the finish. There is one here. Biden (and all the State Department people to follow) will say misleading things in Tokyo and Seoul to reassure heavy hearts that all is as it has long been. In the middle, Biden will tell Xi that the best Washington has by way of savvy horse-traders will soon arrive to start talking in Beijing. Comrade Xi, we are going to correct an old, destructive imbalance now, Biden will also confide before he climbs out of water far too deep for him. The people from State will take over now, easing the Pentagon people gradually aside, where they ought to have been all along. Put it in the “best outcomes” file. And do not count unhatched chickens.